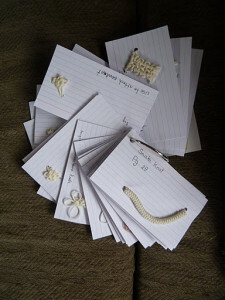 Home » Crochet, Knitting and Knotting » Still Knotting! 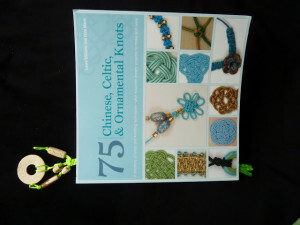 Life in Osoyoos is proving to be busy but I’m burning the midnight oil to complete my self challenge – to produce a sample of each of the 75 knots in the book ’75 Chinese, Celtic, & Ornamental Knots’ by Laura Williams and Elise Mann. I’m hoping that when I get to the projects I can pick up some of the finishing techniques as well. Nancy, a friend in Arizona, offered to teach me some of the basics when I get to Congress but since our arrival is not until late in the winter I couldn’t wait and had the book in my traveling stash. I’m sure there will be lots of new stuff to learn when I get there but at least I will have completed the basics and feel more comfortable working with knots. She linked me to a FB page for the Mateloteurs – an international knotting group – and after a few hours of browsing the pictures and posts I was hooked! Today I will reach the half way mark in my self-challenge of completing the 75 knots. A few have been unravelled and re-attempted a couple of times and one, the Plafond knot, almost beat me. The problem was to understand which loops to ‘fold’ and it took me three different approaches, two on U-tube and another two web posts in addition to the book to finally figure it out! In the end it was simple! I am currently working with lengths of drapery cord that I had in my cording bin. They come from ‘shortening’ some mini-blinds purchased for a house addition many years ago and I can’t think of a better use for them! I like working with this cord but when I priced it in a shop yesterday I discovered it was $1.40 a yard! Too expensive! I also deviated last night and produced a ‘book mark’ using #18 Mason’s line, a nylon cord I found in the hardware store. 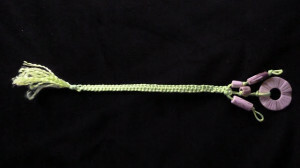 It is much softer and may have uses in making jewelry but doesn’t hold the knots as well as it is somewhat springy. The florescent colors also limit how I will use it! I am experimenting with cord that is readily available as I am waiting until we head south to the US to find/order satin cord etc. We are in a very rural wine-grape growing area and the small towns through the valley don’t offer a lot of resources and I haven’t identified a Canadian on-line source yet.